The controversial game Hatred will not be available for purchase on Steam. "Yesterday I heard that we were taking Hatred down from Greenlight. Since I wasn't up to speed, I asked around internally to find out why we had done that. It turns out that it wasn't a good decision, and we'll be putting Hatred back up. My apologies to you and your team. Steam is about creating tools for content creators and customers. "Good luck with your game. Original story: Yesterday developer Destructive Creations launched a Steam Greenlight campaign for its game, Hatred. Valve removed the game from Greenlight shortly after it landed on Steam. Developers can post information about their games on Steam Greenlight for the community to vote on whether they would like to see those games on Steam. When Hatred first arrived on Greenlight, Destructive Creations director Jarosław Zieliński wrote on the company's website, "Don't just wait, tell your friends about it, and let their friends tell their friends, so the Apocalypse will spread everywhere!" However, Valve removed the game from Greenlight not long after it arrived. In an interview with Polygon, Doug Lombardi, Valve's VP of marketing, said, "Based on what we've seen on Greenlight, we would not publish Hatred on Steam. As such we'll be taking it down." 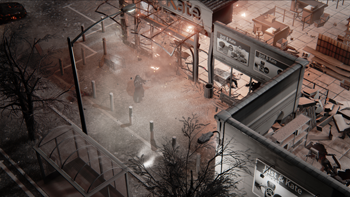 Destructive Creations announced Hatred in October, marketing the game as one with a "disturbing atmosphere of mass killing, where player [sic] takes the role of a cold blood antagonist, who is full of hatred for humanity... Gather equipment of the dead 'human shields' to spread Armageddon upon society." Having Hatred removed from Steam hasn't shaken Destructive Creations. The company posted a screenshot of the game's stats on Steam Greenlight just after it was banned. At that time, it had reached the seventh highest rank in Greenlight with 13,000 votes of support. "Even though games like Manhunt or Postal are still available on Steam we of course fully respect Valve's decision, as they have right to do so," the company stated. It plans to release Hatred in the second quarter of 2015. Destructive Creations is, of course, free to sell its game elsewhere, but Valve's Steam service has a near-monopoly on the PC gaming market.